Classic #BALLPOINT: Ever forget the name of someone you know well? Barbie and Billy return from the Puppy President Earth with a surprise! From 2003: #BillyBallpoint's Workplace Advice for YOU! Billy Tells Barbie Why an Alt USA Elected a Puppy #POTUS! From 1999: The Original Final Ballpoint Adventures comic! Back in 1999, my plan was to only draw BALLPOINT ADVENTURES for a limited time. This was to be the final strip. However, before too long, I felt the urge to resurrect Billy and Barbie Ballpoint to ax society even more challenging questions. 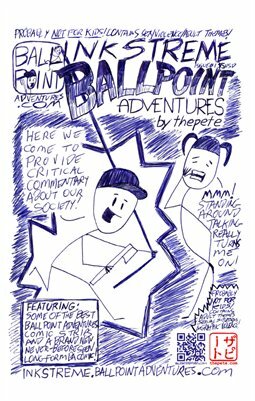 Stop by BallpointAdventures.com in a week's time to learn the specific reason why BALLPOINT ADVENTURES was brought back! In the meantime, want to hear me rant in my own voice? Go listen to the latest #thepete #podcast! Don't forget to pick up YOUR copy of INKSTREME BALLPOINT ADVENTURES! Go Patreonize me for as little as a buck a month! Billy and Barbie Visit Another Reality! Billy and Barbie Decide to find another Reality! This just might be the beginning of a new storyline where Billy and Barbie actually have an actual adventure! From 1999: Billy really GETS this Whole "Violence" thing!